You read about my Diwali celebrations in my last post, now you can read about the other Diwali celebrations I was part of…. Wherever we went this last week, all we saw were people celebrating Diwali in their own way – there was so much I wanted to photograph, but a hectic tour programme did not give me time to stop at all the places I wanted to, so here are just a few glimpses….. Many of you have appreciated my rangolis..... thank you all so much, but here are some more, which are far better, especially since they have been made with far more ease and perfection than mine can ever hope to attain…. Many of these were seen at Omkareshwar and some at Indore….. we saw many more at Shirdi, but unfortunately did not have my camera to capture them…. 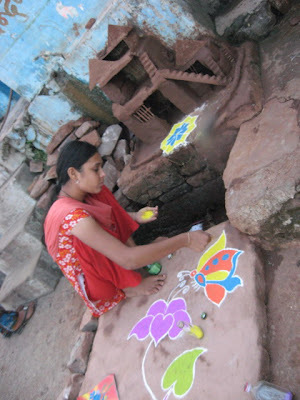 And finally, here is the best one (in my opinion)… this girl was hard at work and did not even realize that we had stopped to see her… she had already made a clay castle or fort, and was in the process of adding the finishing touches to her rangoli….. Making a fort is a tradition in some parts of the country, it seems…… I was unaware of this, and welcome more information about the custom, in case you happen to know more….. Yes, Srivats......that is what captured my attention.... i have no idea why they build a fort... am trying to find out. 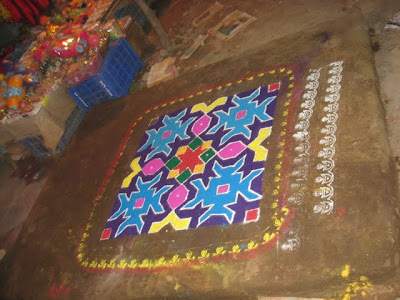 Lovely Rangoli's Anu. I hope you had a wonderful Diwali. Lovely Rangolis and they reminded me of the days I was in Maharashtra..on Diwali there use to be a competition in the colony kids about whose rangoli would be the best and there only I saw so many different ways of making it. Many thanks for sharing this and bringing back a smile on my face. "Bali Padyami is a the most important day for us here and commemorates the victory of Lord Vishnu in his dwarf incarnation Vamana defeating Bali, and pushing him to the nether world. According to Hindu mythology, Bali, a demon king was well known for his bravery, uprightness and dedication to god Vishnu. Bali was also considered invincible since he was a great devotee of Vishnu. The gods, upset by the harassment meted out to them by the asuras, and jealous of the popularity of Bali asked approached Lord Vishnu for help. Vishnu in the avatar of Vamana, approached Bali seeking reverence and alms. Aware of the generous nature of Bali, he sought a gift of three paces of land from the king. Bali readily agreed. Vamana now assumed his universal form and placed his first step forward, which occupied the entire universal space. With his second step he occupied the earth, except the space where Bali was standing. Since there was no other space available to put Vamana’s third step, Bali readily offered his own head for Vamana to put his third step, fully realising that the person who was asking for such gift was none other than Vishnu himself, hence being pushed to Patala Loka. But, pleased with the generosity of Bali, Vishnu grants him a boon that he could return to earth for one day in a year to be with his people and light millions of lamps to dispel the darkness and ignorance and spread the radiance of love and wisdom. It is this day that is celebrated as Bali Padyami. We make a fort for King Bali using cow-dung and marigold flowers, light lamps and perform the puja. You must be busy travelling, or are you back ? Hi, first time on your blog. Liked the rangoli and the concentration on the girls face. I liked what you wrote in your profile about travelling. I loved to travel and really like to visit the uncommon places. 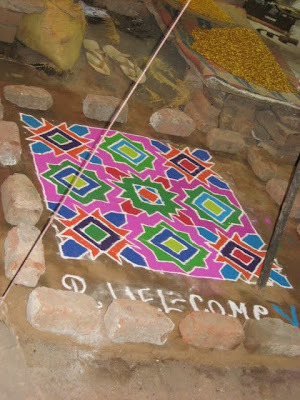 lovely rangoli...reminds me of my hometown!! 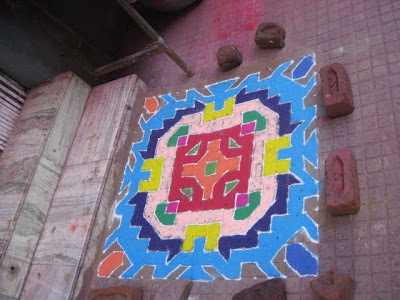 Great captures of Rangoli designs.